357 Marlborough is located on the north side of Marlborough, between Gloucester and Hereford, with 355 Marlborough to the east and 20 Hereford to the west. 357 Marlborough was built ca. 1872 for builder and contractor George Martin Gibson, for speculative sale, one of eleven contiguous houses (337-339-341-343-345-347-349-351-353-355-357 Marlborough). Click here for an index to the deeds for 357 Marlborough. On November 15, 1873, 357 Marlborough was purchased from Hiram Gerrish by Joseph McIntire, a wholesale provisions (produce) merchant in partnership with Elbridge G. Knight in the firm of Knight & McIntire. On the same day, Hiram Gerrish also sold Joseph McIntire 337 Marlborough, 345 Marlborough, and 355 Marlborough, and sold Joseph McIntire and Elbridge Knight, as partners, 347 Marlborough and 351 Marlborough. They purchased the houses as rental property or for re-sale. By the 1876-1877 winter season, 357 Marlborough was the home of art dealer Joseph Dudley Richards and his wife, Elizabeth Nicolson (Woodbury) Richards. They previously had lived at the Hotel Hamilton at 260 Clarendon. 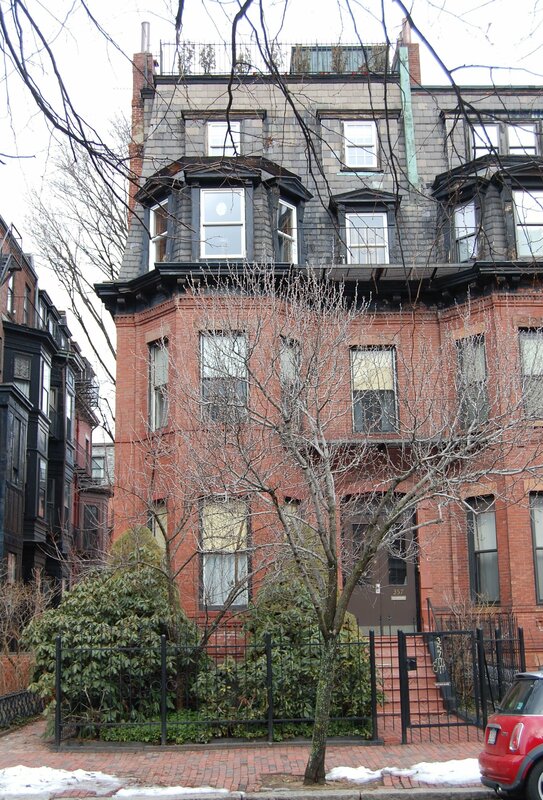 They continued to live at 357 Marlborough during the 1879-1880 season, but moved thereafter to 227 Newbury. 357 Marlborough was not listed in the 1881 Blue Book. By the 1881-1882 winter season, it was the home of musician and composer George Laurie Osgood and his wife, Jeannette Cabot (Farley) Osgood. They had lived in Cambridge in 1880. They continued to live at 357 Marlborough during the 1885-1886 season, but moved thereafter and were living in Cambridge again by 1888. By the 1886-1887 winter season, 357 Marlborough was the home of Benjamin H. Fabens and his wife, Rebecca S. (Chamberlain) Fabens. They previously had lived at 242 Newbury. He was a Salem shipping merchant trading primarily with Cayenne, in French Guiana, in partnership with his brother, Charles Eugene Fabens. He later would become a bank president in Salem. By the 1888-1889 winter season, they had moved to the Hotel Royal at 295-297 Beacon. 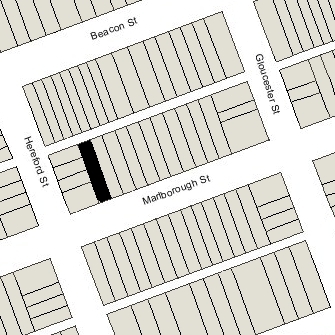 On June 16, 1888, Benjamin Fabens acquired 357 Marlborough from Joseph McIntrire, and on the same day he transferred the property to Sarah Maria (Parker) Cunningham, the widow of shipping merchant Frederic Cunningham. She previously had lived at 273 Clarendon. During the 1893-1894 and 1894-1895 winter seasons, she lived temporarily with her son-in-law and daughter, Rev. William and Julia (Cunningham) Lawrence, at 122 Commonwealth, which they purchased in May of 1894 following his consecration as Episcopal Bishop of Massachusetts in October of 1893. Sarah Cunningham probably helped take care of their children (their daughter Elinor was born in January of 1894) while they settled in the house. While Sarah Cunningham was living at 122 Commonwealth, 357 Marlborough was the home of Miss Susan Upham and Miss Susan W. Vincent. They previously had lived at 356 Marlborough. By the 1895-1896 season, Sarah Cunningham had moved back to 357 Marlborough, and Miss Upham and Miss Vincent had moved to 379 Marlborough. Sarah Cunningham continued to live at 357 Marlborough until December of 1901, when she purchased 124 Commonwealth, next door to the Lawrences. 357 Marlborough was not listed in the 1903 Blue Book. On February 2, 1903, 357 Marlborough was purchased from Sarah Cunningham by Ella Bowman (Greene) Lord, the wife of ship and real estate broker Robert Waterston Lord. They previously had lived in an apartment at 405 Marlborough. Ella Lord died in March of 1904. Robert Lord continued to live at 357 Marlborough until his death in August of 1908. On October 26, 1908, 357 Marlborough was purchased from Robert Lord’s estate by Alice Woodward (Brown) De Normandie, the wife of Dr. Robert Laurent De Normandie, He was an obstetrician and also maintained his medical office in the house. They previously had lived (and he had maintained his office) at 31 Massachusetts Avenue. They also maintained homes in Cataumet and Lincoln. In April of 1913, the De Normandies acquired 355 Marlborough, which they converted into medical offices. In August of 1916, Alice De Normandie applied for (and subsequently received) permission to cut doors between 355 and 357 Marlborough on the third floor. The De Normandies continued to live at 357 Marlborough until about 1928, when they made Lincoln their year-round home. He continued to maintain his medical offices at 355 Marlborough. By 1930, 357 Marlborough was the home of Mrs. Ethel (Barroll) Ducey, the former wife of John Francis Ducey. Their children – John Francis Ducey, Jr., Maria Barroll Ducey, and James G. Ducey – lived with her. They previously had lived in Brookline. Maria Ducey married in August of 1936 to Joseph Turner Ryerson, Jr. Ethel Ducey and her sons moved soon thereafter. By 1940, the entire family was living in Harding, New Jersey. 357 Marlborough was not listed in the 1937 Blue Book. In April of 1937, Alice De Normandie filed for (and subsequently received) permission to convert 355-357 Marlborough from single-family dwellings into a school and dormitory for the Nursery Training School of Boston. On May 29, 1937, she sold both houses to the school. The Nursery Training School prepared women to become nursery school teachers. The school continued to be located at 355-357 Marlborough until about 1954. On August 24, 1954, 357 Marlborough was acquired from the Nursery Training School by Miss Maureen (Mary) Bernadette Clarke. On the same day, 355 Marlborough was acquired from the school by her mother, Aileen Susan Frances (McAneney) Clarke Venezia, the widow of Patrick Clarke and the wife of Eugene J. Venezia, a contractor. The Venezias lived in an apartment at 470 Beacon. In April of 1955, Maureen Clarke applied for permission to convert the property from a school and dormitory into a school for design of clothing. The application was denied and it appears she did not pursue it. At about this time, Maureen Clarke married to Richard B. Desmond and on April 27, 1955, Eugene and Aileen Venezia acquired 357 Marlborough from her. On September 23, 1955, 357 Marlborough was acquired from the Venezias by Edward Marion and his wife, Miralena (Economu) Marion. That same month, he filed for (and subsequently received) permission to convert the property from a school and dormitory into a single-family dwelling and lodging house. They previously had been lodgers at 256 Commonwealth. On December 9, 1999, they transferred 357 Marlborough to their daughter, Mayda Marion. 357 Marlborough remained multiple dwelling, either a lodging house or apartment building, assessed as a four- to six-family dwelling, in 2017.